The Pebble has arrived! At $150, the Pebble is the first watch built for the 21st century. It’s infinitely customizable, with downloadable watch faces and useful internet-connected apps. The Pebble connects to iPhone and Android smart phones using Bluetooth, alerting you with a silent vibration to incoming calls, emails and messages. The Pebble is a minimalist yet fashionable product that seamlessly blends into everyday life. After a wildly successful Kickstarter campaign that rose over $10 million, the Pebble Smartwatch has finally come to fruition. Is it everything its creators promised it would be? Yes and no. The Pebble is still a work in progress, but it is a good work in progress. It synchronizes with iOS and Android smartphones, delivering notifications right to your wrist. Unfortunately, Pebble does not work with Blackberry, Windows Phone 7, or Palm phones at this time, which proves that there are still some rough edges in both software and app compatibility. Despite this, the Pebble shows plenty of potential. Although it doesn’t have a solid feel due to its hollow casing and soft watch face, there is a certain elegance to the Pebble’s design. The polyurethane band is also a bit understated but it can be exchanged for any standard 22mm watchband. On the left side is a single button that brings you to the Menu page, while the right side houses Up, Down, and Select buttons for navigation. Tapping any of the buttons activates the Pebble’s backlight, and quick movements of your wrist light up the display, which is a nice touch. Another standout feature is the customizable watch face. When I first saw the Pebble Smartwatch, the display screen reminded me of a flip phone from a couple of years ago, due to its small secondary LCD on the outside that displays notifications and time. 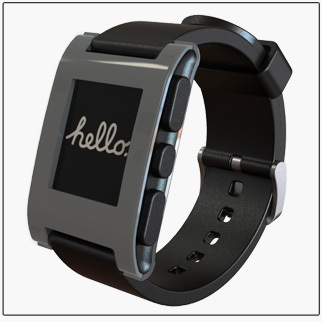 The Pebble is that small notification LCD, just wireless and on your wrist. Still, it is a useful concept because it eliminates the need to check your phone for updates, when you can’t reach for it. Despite some minor bugs, the Pebble does have many advantages. The rechargeable battery keeps it going for 7+ days. 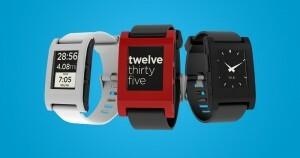 The Pebble is also waterproof, rated at 5 ATM, and tested for both fresh and saltwater. You can swim with it and change tracks while in the shower. The Pebble also has a scratch and shatter resistant lens with an anti-glare optical coating. It is a Bluetooth device, similar to a Bluetooth headset. It does affect the battery life of your phone, usually using up an extra 5-10% per day. A special USB cable is also included allowing you to charge your pebble using your computer. As for colors, The Pebble is currently available in black, white, red, orange, or gray, but in time, I am sure more will become available. For those of us tired of constantly checking our phones, the Pebble could possibly be a good investment.